American U.S. Airman 1st class Spencer Stone became well known in August earlier this year. While on a train from Amsterdam to Paris, he helped overpower the armed gunman Ayooub El-Khazaani who opened fired on the train. 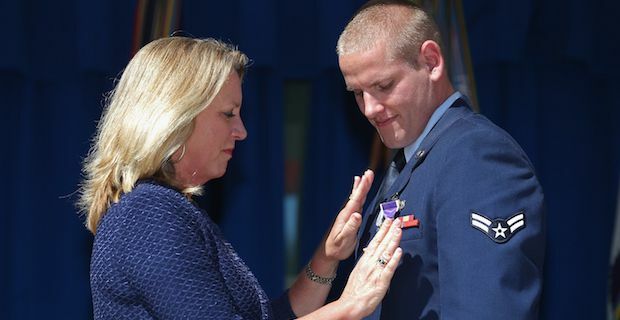 Mr. Stone was stabbed with a box cutter during the attack but eventually, with the help of his friends Alek Skarlatos and Anthony Sadler, overtook the gunman. Stone eventually choked him until he was unconscious and then proceeded to tie him up. All three of these men were awarded by President Francois Hallande, the Legion d'Honneur for their bravery which is the highest honour one can receive. Stone was also awarded Airman's Medal and a Purple Heart. Early Thursday morning Stone was stabbed four times in the chest, specifically the heart and lung according to CBS News. It is said that he was trying to protect a friend in downtown Sacramento. The police said, "It is believed that the victim was out with a group of friends when a physical altercation led to the victim being stabbed." The crime was so violent that they closed two blocks off and initially treated it as a homicide. Thankfully now the hero is said to be in stable condition.